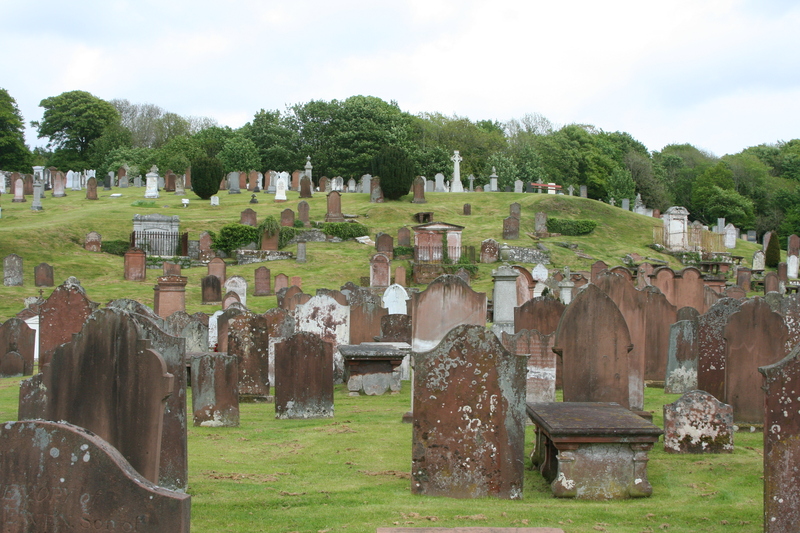 St. Cuthbert's Cemetery, Kirkcudbright. Searching for dead ancestors includes spending lots of time in graveyards. Note the size of the tombstones. They are filled with writing memorializing family members. But first, just how do you pronounce Kirkcudbright? I think it’s a test Scots give to unsuspecting tourists. If you come up with kir-COO-bree and not kirk-cud-bright, you get a gold star. Kirk, by the way, is a Scottish Church. Cudbright is a reference to Saint Cuthbert, an early luminary of Scotland who is rumored to have said his prayers while standing naked submerged in the ocean. Why do saints do things like that? Afterwards, sea otters were supposed to drop by and warm him up. Hmmm. Carsluith Castle and the Marrbury Smokehouse where we bought delicious smoked salmon and Brie Cheese. 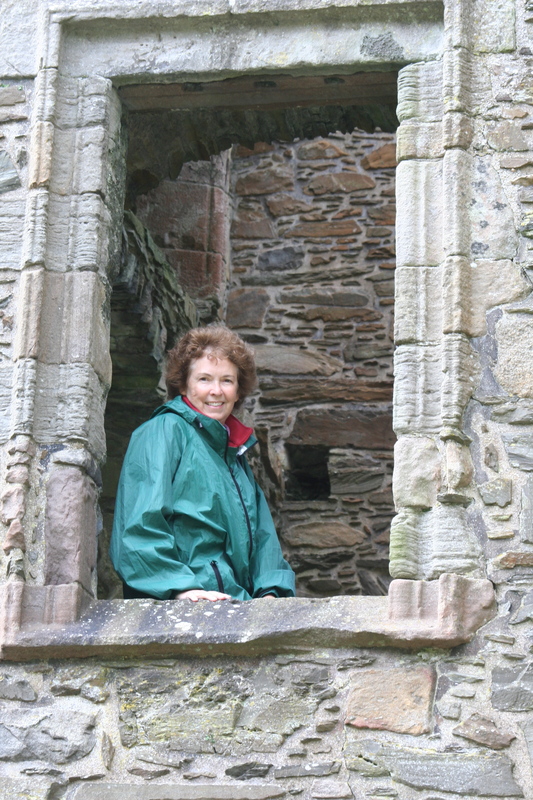 Princess Peggy looking out the window of Carsluith Castle smiles at the mere mortal taking her photo. Kirkcudbright is a very attractive community. McClelland Castle dominates the town. 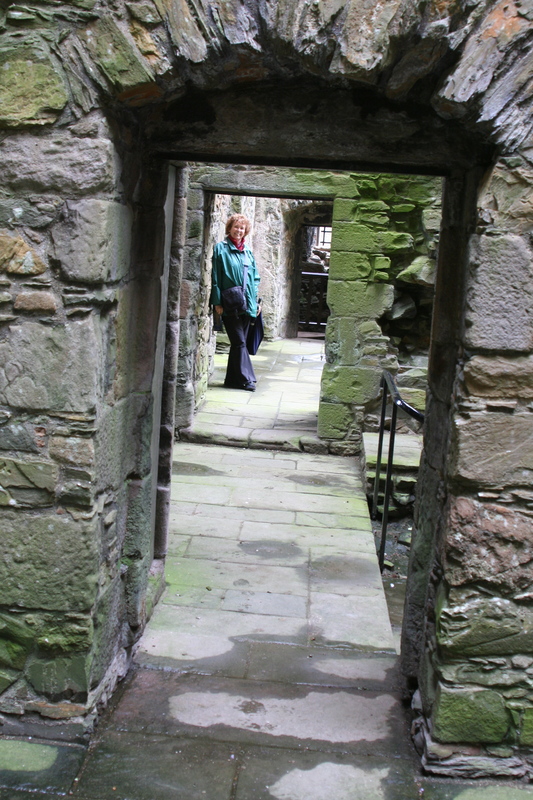 Our brochure suggested that Robert McClelland of Kirkcudbright built the castle for conspicuous consumption as well as protection in the late 1500s when there was a slight break in Scotland’s bloody history. McClelland Castle, Kirkcudbright, as it looks today. An inside view of McClelland Castle. Note the thickness of the walls. 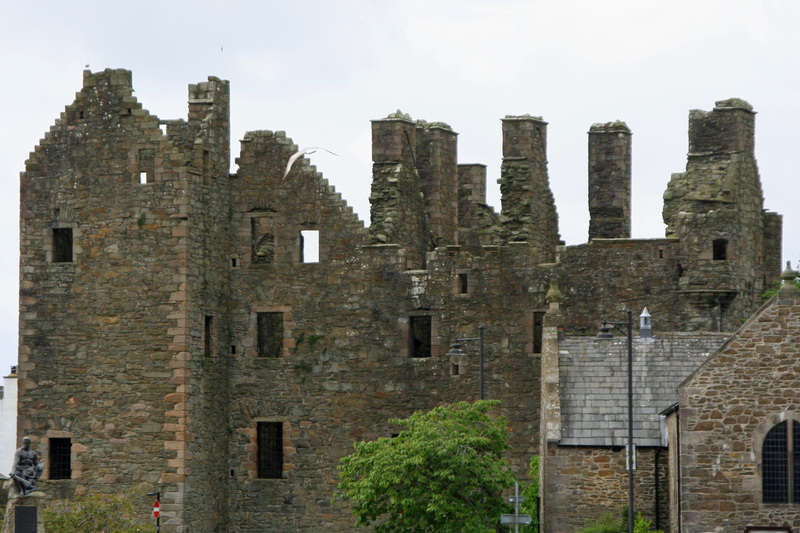 By the mid 1600s the castle was on its way downhill, a victim of the commitment of the Lord’s of Kirkcudbright 2 and 3 to the Covenanter Movement. The Covenanters were serious Presbyterians who firmly believed that Jesus Christ, not the King of England, was the rightful head of their church. The King didn’t approve. Consequently, there were lots of Covenanter Martyrs, including at least one of my ancestors, John Brown of Priesthill. You will meet John in a later blog. McClelland could have been a distant relative as well (or not) since Browns and McClellands hooked up in the America of the 1700s. All I have to go on is the strong bond between Covenanter leaders that seemed to transfer to early America. Peggy, on the other hand, had definite Kirkcudbright ancestors, the Kevans. I suggested possibly they worked as servants for the McClellands and got in trouble (grin). Turns out the Kevan/Cavan family was quite prominent in Kirkcudbright’s history. Peggy and I dutifully did a walking tour of the town under cloudy skies threatening rain. 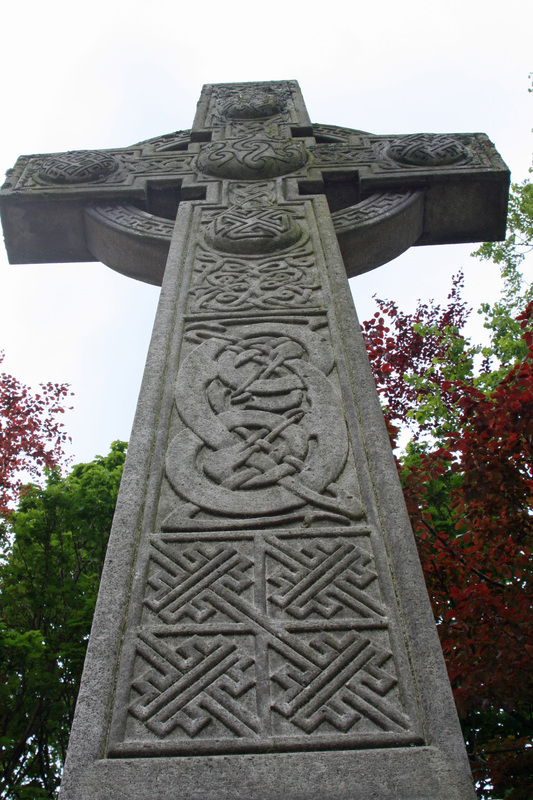 Highlights included the Tollbooth, an eclectic museum, a Celtic cross and the town in general. The Tollbooth was once responsible for collecting taxes and serving as a jail for Covenanters and witches. It now serves as an art center. 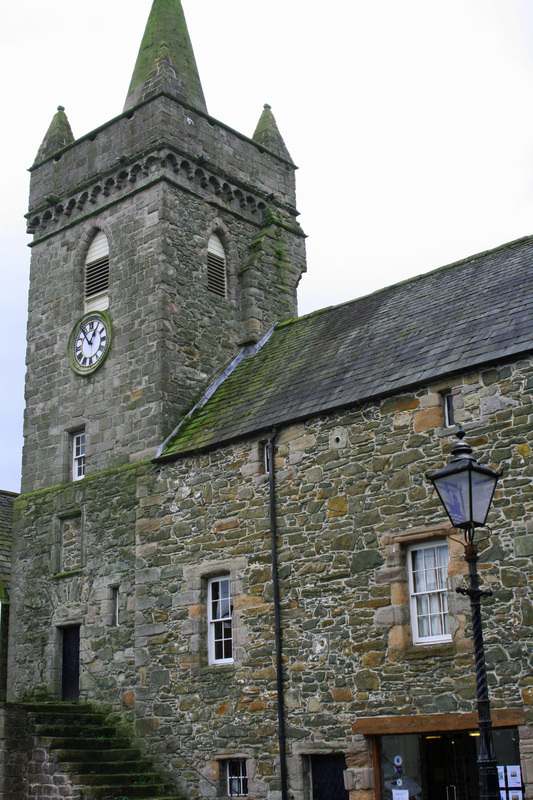 The museum brought us up to date on just about everything of importance to Kirkcudbright including the towns relationship to John Paul Jones, a native of Scotland and a slave trader before he joined the American Revolution. 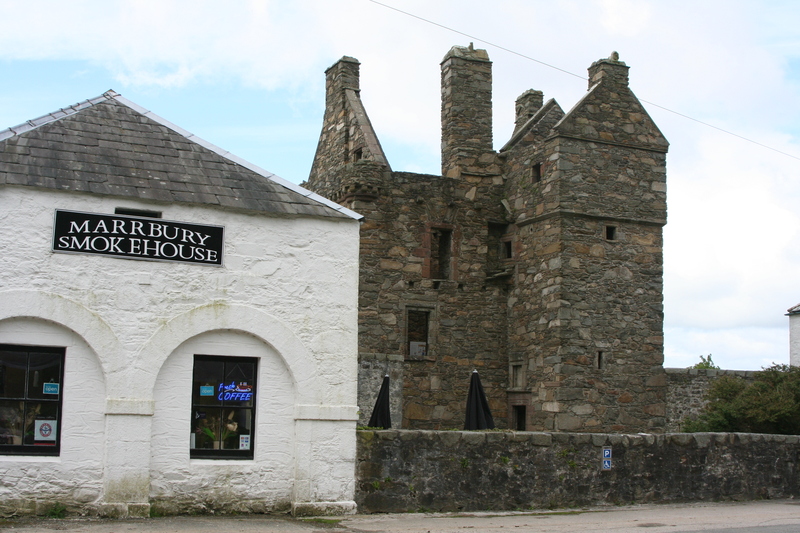 The Kirkcudbright Tollbooth which once served as a tax collection center and jail. It now serves as an art center and recognizes Kirkcudbright's commitment to the arts. 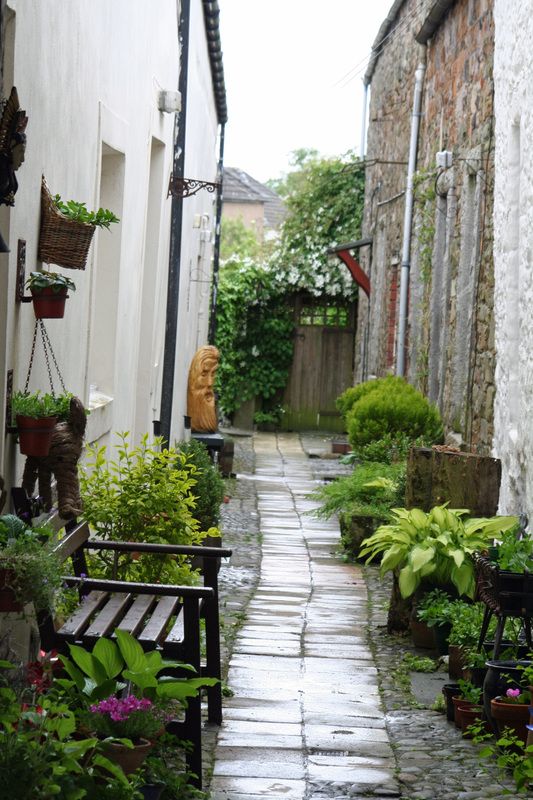 A walkway off of High Street, Kirkcudbright. We often found these intriguing paths filled with flowers and even art work off of main streets in Scotland's towns and villages. 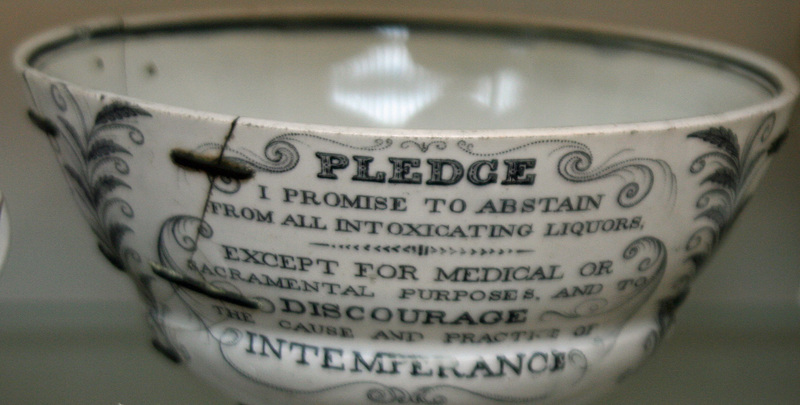 This 'take the pledge' bowl we found in the Kirkcudbright Museum amused me. I suspect my Scottish Grandmother would have approved. 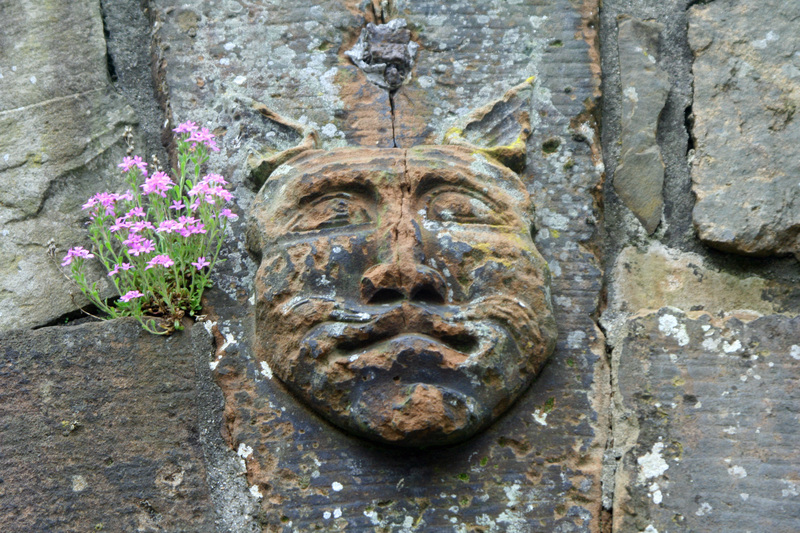 I was also amused by this gargoyle like cat-man we found over an arch near McClelland Castle. The flowers added a nice touch. I suspect cat man's job was to frighten off evil spirits. 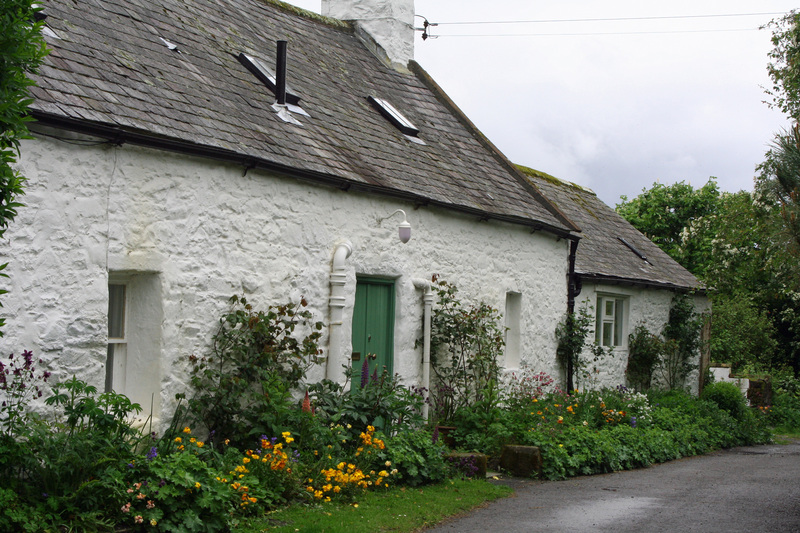 What photographer can resist a picturesque cottage? Having sated our desire to see Kirkcudbright we headed back to Creetown. Next blog we visit Wigtown, Scotland’s bookstore center, stop by an ancient druid monument, and visit the birthplace of my Great Grandmother, the colorful village of Kirkcolm. 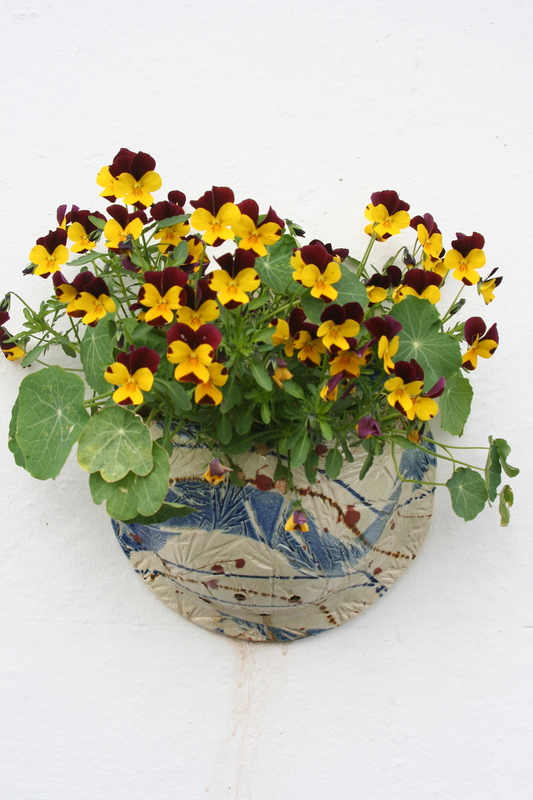 We found this pretty flower box attached to a house in Creetown.